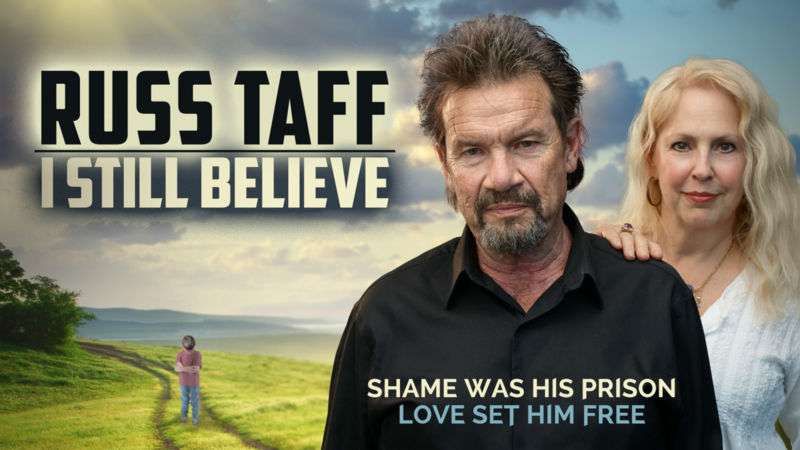 Russ Taff is a giant in the gospel world, with six Grammys under his belt, induction to The Gospel Music Hall of Fame, and countless other accolades. But that isn’t the take away after watching “I Still Believe,” a new documentary covering his life and career. The film certainly touches upon those milestones, but at its core is a story of relationship and family: The power of mothers and fathers to create and destroy, the relationship of a husband and wife in the aftermath of a turbulent childhood and ultimately the healing power of The Father’s love. In the final minutes of “I Still Believe,” singer/comedian Mark Lowry comments “I’d rather someone show me their scars than show me their trophies.” Russ and his wife Tori don’t just give us their highlight reel, they let us into the nit and grit of their journey. Their scars are proof that even the deepest wounds can heal. The son of a preacher, Russ grew up in a violently abusive home and the resulting pain sent him on a cycle of alcoholism. He was able to sustain periods of sobriety, but the pain of his childhood continued to circulate throughout his life. Though alcohol was eroding his marriage and family life, Russ was able to keep his struggles from his colleagues in the music industry. But after his mother passed, the trauma of his childhood became impossible to ignore and Russ crossed a line he never had before when he showed up to a videotaping drunk. As devastating as that moment was, it was equally pivotal and ultimately proved to be a tipping point towards the deeper healing Russ was searching for. One of the most touching and redemptive moments in “I Still Believe” is seeing the aftermath of that taping. It was evident to the other artists and production team that Russ was under the influence. Yet, instead of exposing him, they chose to protect and cover him. As Tori says “To this day that stands in my mind as one of the most loving, merciful things I have ever been a part of.” In a world where Christians are so often typecast as unloving hypocrites, it’s very moving to see the compassion of the people who came around Russ that day. After that night and the subsequent confrontation with Tori, Russ finally found treatment that began to heal the deep wounds of the past. The true unsung hero of this story is Tori Taff. A brilliant songwriter in her own right, Tori’s vulnerability and strength is palpable as she speaks of walking through those years. Referencing the addiction, she explains “It became the third person in our marriage.” She remained a rock to her family through years of heartbreak, and faithful even when Russ himself expected her to give up on him. The Taffs do us the great honor of allowing us into their world without shame and without hiding any of the pain on their road to healing. And it is powerful. Their story is not “patty-cake” Christianity. It is heartbreak and picking up the pieces. It’s a story of a man finding a heavenly father, and a wife’s journey rebuilding trust after betrayal. “I Still Believe” was named after the song of the same title, which has become one of Russ’ staples. After being allowed into the Taffs’ story, it’s easy to understand why. When Russ Taff sings “But I’ve never gone so far that I’ve forgotten my way home. The best things always bring you back again over and over.” He’s not just performing that song, he’s living it.